Way Back in 1963 the Magic Castle opened its doors to the outside world so it could see the great variety and talent of magicians from all over the world. It began simply, but kept growing until today it is a world famous and beloved institution. So it is with someone who wants to learn how to do card tricks. They begin in an easy manner with simple props and a minimum of skill. Slowly they grow in stature until someday they can hold their own with any other card magician in the world. This booklet, small as it is, is the Open Sesame for people who want to learn to do card magic. 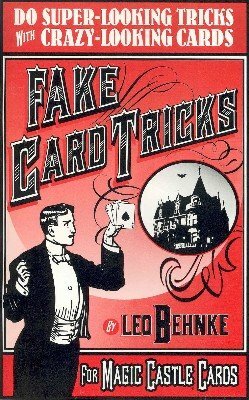 It is to be used with one or two of the Magic Castle decks of playing cards, as well as the very special Fake Deck. With these simple props the beginner can start learning and performing card tricks with unusual and baffling effects. They're easy to do, and will open up a world of secrets, wonder, and appreciation. 1st edition 2002; 37 pages.